Either way, has this shift unlocked enough major, online-specific benefits? So far, that’s unclear. Two of the upcoming game’s three modes—co-op “zombies” missions and traditional versus battles—look remarkably similar to what’s already come from the zillions of CoD development houses under Activision’s purview. This week’s pre-release CoD:BO4 beta test, on the other hand, teases a tidal change for the series: a new “Blackout” mode. As in, CoD’s first shot at the 100-player battle royale genre, popularized by the likes of PUBG and Fortnite. Normally, we go into beta tests with grains of salt wedged into our hands, and this Blackout test—which takes combat out of CoD’s traditional, enclosed arenas and into a massive, PUBG-scale world—was no exception. But, folks, if the PS4 test is any indication, Activision and its subsidiary studios have done the seemingly impossible: they’ve translated CoD’s tight combat into a gargantuan world without sacrificing either 60fps performance or combat depth. … only this one has its share of weird quirks. For example, you dive into battle in a high-speed wingsuit. A peek into this upscale home’s garage reveals some gadgets, including this remote-controlled car. The car works best when you go into hiding and drive it to scout out nearby environs, preferably with a teammate covering you while you’re distracted by the car’s view. If you’d prefer a driveable car, you have options: this two-person ATV, or a massive, slow, four-person truck, or a two-person boat, or a four-person helicopter. Sometimes, you’ll run into NPCs in the middle of battle. Kill them to net valuable loot. The beta test launched on Monday exclusively for PS4 consoles, solely to players who pre-ordered CoD:BO4, following a week-long test of more traditional online-versus combat. (Windows and Xbox beta tests of Blackout will start on Friday.) Our impressions are based on a few hours of testing since the Monday rollout, during which time Activision has already pushed one patch. In both a big- and small-picture way, CoD’s Blackout mode borrows liberally from PUBG. The safe zone’s circle shrinks and moves almost identically to PUBG‘s version. Your soldier can stand, crouch, or fall to a full-prone crawl. Weapons can be augmented with pickups like scopes and grips. Quick two-person buggies and slower four-person trucks help teams traverse the map quickly. And health must be recovered using healing items. Conversely, Blackout doesn’t crib much from Fortnite‘s take on the genre. Armor is an item-based pickup, not a refillable, Fortnite-styled potion; weapons generally don’t come in “rarity” tiers; and there’s zero crafting or building to be found. The easy way to put it, then, is that Blackout sees your standard, only-slightly-zany PUBG formula and raises it with bolted-on, Bruckheimer-esque attachments. For example, freaking helicopters! Every Blackout match hides a few military-grade choppers around the map, which conveniently seat up to four soldiers (one pilot, three passengers). This is a first for a major battle royale shooter. Unlike the Battlefield series’ tricky, “authentic” helicopter controls, these are absolutely easy to pilot: one button raises altitude; another lowers it; and joysticks control your movement on a flat plane. Choppers don’t get their own turrets, but they don’t really need ’em; based on my experience, having a scoped rifle and a good view of an open field should be plenty to pester, if not outright kill, anybody caught in your sights. But as any seasoned FPS pro will tell you, you can’t put an “overpowered” chopper in a video game without adding a rocket launcher as a countermeasure. 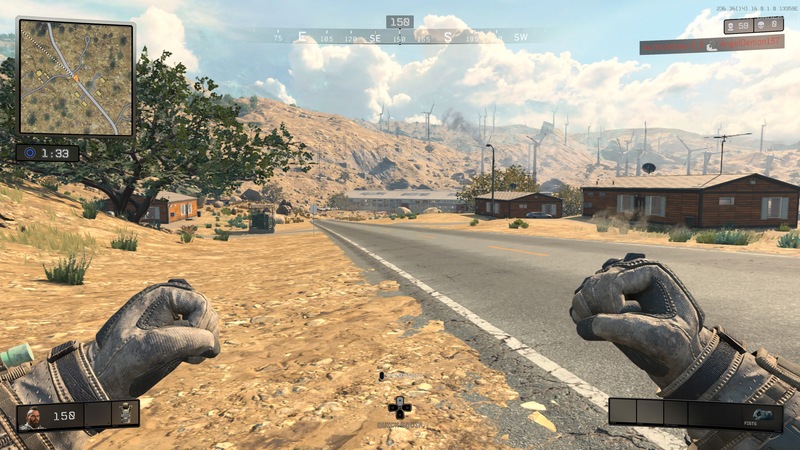 Blackout’s launchers offer heat-seeking ammo, at that, so long as you can steady your aim over the helicopter or vehicle in question for a couple of seconds. The full map for the Blackout mode. A peek at the game’s backpack and inventory menu. You only get half this much storage space until you find a “backpack” pickup on the ground in a game. Blackout also includes a unique range of temporary, one-time-use boosts. Each of these offer 90-120 seconds of particularly useful perks: silenced footsteps, amplified hearing of nearby foes’ steps, reduced healing and reviving timers, being able to see high-value items and pick-ups through walls, or an audible blip whenever an enemy targets you with a weapon. Unsurprisingly, you can only activate one of these at a time, and each fills up valuable space in your backpack (which you can’t expand as much as in other battle royale games). In practice, these perks are already doing the trick, because they organically prod four-player squads to coordinate. One person goes silent to scout; another jacks up hearing to pick out potential threats; a third takes the “iron lung” perk to hold breathe longer while swimming (yes, you can swim, which opens up some awesome tunnels and shortcuts); and still another flips the “outlander” perk to live longer (and run faster) while outside the safe zone, so as to patrol and sneak up on foes from behind. A few equippable gadgets also figure into Blackout, including barricade shields (which other teammates can hide behind) and remote-controlled cars (which let a player drive a small, camera-equipped car within a certain radius to scope out nearby foes). The latter is the most interesting option, especially for players who hole up in a bunker while waiting in the safe zone and want to scope out incoming threats. All of that on its face may not sound so revolutionary, and that’s fair. PUBG with some quality-of-life tweaks and experiments might not move the needle for you. We’ve seen similar stuff from newcomers like Islands of Nyne, and that game, in spite of its solid early-access launch and thoughtful tweaks, has already lost tons of players. But Blackout has a few things going for it outside of sheer mechanics. Most importantly, the development team responsible for this Call of Duty fork have put a heavy emphasis on frame rate and performance. 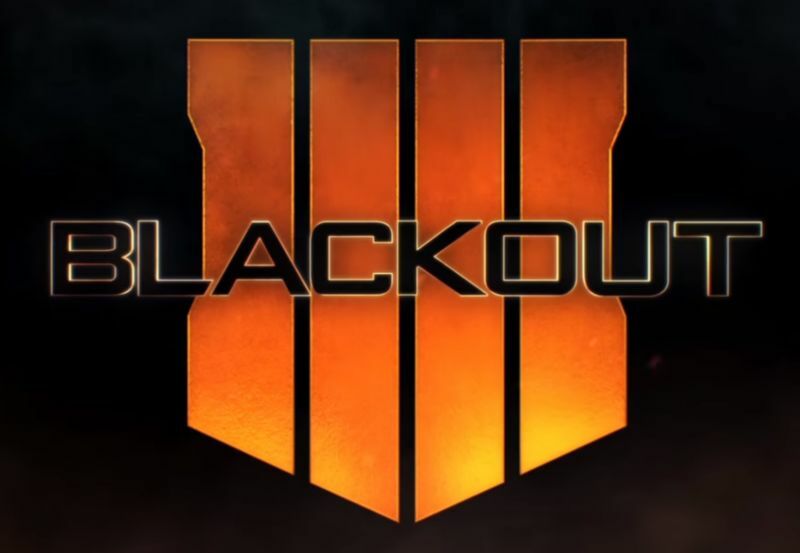 Neither the PS4’s horsepower nor 88-strong online sessions have dragged Blackout’s general gameplay beneath a relatively stable 60fps refresh, even while standing at the top of one of the battle zone’s massive towers and aiming sniper rifles as far as their 6x scopes allow. Enlarge / A screen taken from my tests on PS4 Pro. Sometimes, it’s not the prettiest game by any stretch, but this is what you get for a stable, near-60fps refresh. The compromises here come in the form of resolution—somewhere barely above 1080p on PlayStation 4 Pro—and general detail. One random online teammate shouted the phrase “Super Nintendo trees,” and while I don’t agree that Blackout’s foliage is that bad, it’s actually a little worse than what you’ll find in the console port of PUBG. Level-of-detail rendering for distant objects is scaled back particularly aggressively, as well, and texture variety and quality are pretty weak for this generation. But it’s not as weak as Radical Heights, to be fair, and it says something that Activision has gotten this right in the first day of Blackout’s beta. In comparison, PUBG on Xbox doesn’t look much better, either in the resolution or detail departments, and that console port still struggles to reach a 30fps lock. Plus, Blackout’s map includes a solid variety of building-loaded complexes, all built out with geometric, texture, and color variety to make the large map feel alive and worth exploring. These locations, generally lifted from previous CoD installments, include a posh series of upscale houses (with floor-to-ceiling windows that make them terrible hiding places), a nuclear testing facility (with a series of useful, hidden tunnels—whose ceilings can be exposed with switches on the surface), and an abandoned, New Orleans-esque farming grounds (which is sometimes overrun with NPC zombies, who can be killed to cough up useful loot). This mode also hits the ground running with familiar CoD weaponry—all with expected appropriate takes on recoil, reload times, aiming, and damage—and time-tested first-person mechanics. There’s not much to learn for CoD’s faithful (beyond holding the crouch button longer to go prone), and that familiarity and popularity hasn’t hurt the beta period’s nearly instantaneous queue fills. If any given hour of a weekday, limited solely to pre-order players, can produce quick 88-player matches, that bodes well for player populations once the final version goes live. Not all’s perfect at this point, of course, with the kinds of issues you’d expect in a beta. Random disconnections at the start of a match have plagued most people on my friends list (though not me, somehow). Meanwhile, the game’s current math makes later-game combatants absolute bullet sponges (who can heal all too quickly and easily, to boot). But already, at least, Blackout appears to do PUBG on console—in terms of performance, combat, gadgets, and helicopters—better than PUBG itself does. And this mode still has a month to polish its way to a huge October 12 launch on PS4, Xbox One, and Windows PC.